Preheat the oven to 180°C/350°F. Dice bacon. Peel and thinly slice the shallots and halve the lemon. Cut the skin of the veal in a diagonal crosswise pattern. Place the veal in a roasting pan just large enough to fit the meat. Season with salt. Spread the shallots on top and cover with the bacon. Squeeze the lemon over the meat, then sprinkle with the breadcrumbs. Season with pepper to taste and roast for approx. 50 min. Add the water and continue roasting for approx. 10 min. or until the meat is tender. Remove from the oven and let the meat rest for approx. 10 min. 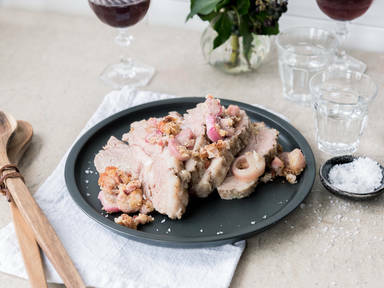 Cut the rested meat into thick slices, season with flaky sea salt, and enjoy with a glass of red wine!